In early April, members of the 2014 U.S. Olympic Team headed to the nation’s most famous address, 1600 Pennsylvania Avenue, to meet with President Barack Obama and First Lady Michelle Obama. In addition to the responses seen in SKATING magazine, here are how the conversations went for Nathan Bartholomay and Marissa Castelli. POTUS: Nathan, it is an honor to have you here. N: It’s a privilege to be here sir. Truly an honor. 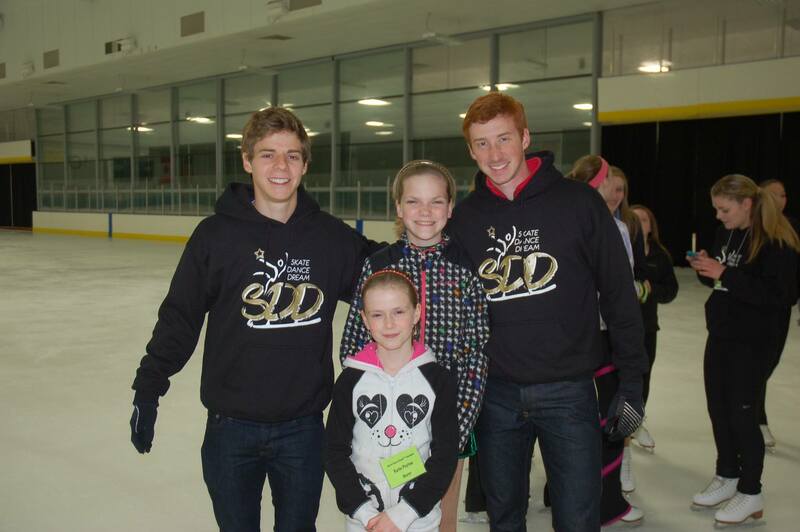 P: My wife and I are very busy but we did get to see some of the figure skating, we are so proud of you and Felicia. N: Wow thank you sir, I can’t tell you what that means coming from you! P: Thank you for representing your country so well at the Olympics. We experienced formatting issues with club survey results that pertain to U.S. Figure Skating’s four-year strategic plan in March’s SKATING magazine (pages 60-61). We apologize for the error. The correct survey results can be found by clicking here or on the image below. As the Olympic spirit took hold in the week following the 2014 Prudential U.S. Figure Skating Championships, the synchronized skating season began with four American teams taking the ice at Leon Lurje Trophy in Gothenburg, Sweden. The Synchroettes junior team, hailing from West Orange, N.J., paced Team USA’s efforts with a silver medal – an improvement on their bronze-medal finish at this event a year ago. The Synchroettes were in a very tight battle with Sweden’s own Team Spirit. They conceded the short program to Team Spirit but overcame the 1.05 deficit to sneak into silver medal position after the free skate, set to the music from “Jesus Christ Superstar”. Their total score of 136.28 was just .21 better than that of the bronze medalists. Miami University junior team finished 5th in both segments, earning 122.82 points total. In the free skate, the team earned the highest base value, 37.10, of all the junior teams. They earned the highest technical levels for their no hold element, moves in the field element and line. Also representing Sweden, Team Convivium easily took the junior title with 156.45 points. They were the only team to break 50 points in the short program and 100 in the free (103.58). The senior event featured reigning World champions Team Unique of Finland as they cruised to a nearly 20-point victory and hit 199.15 points. Their lead of more than 10 points, following the short program, only grew with their “Women out for Revenge” free skate. They shared the podium with Sweden’s Team Surprise and Boomerang. The Skyliners, representing The Skating Club of New York, began their second international season with a fifth-place showing at Leon Lurje Trophy. Less than three points of out of bronze medal contention following the short program, the Skyliners were unable to pull ahead of the teams from Sweden and Finland. The ICE’Kateers, hailing from Southern California, finished sixth in both segments, and showed great improvement in their free skate, which earned them 90.96 points. It’s been six years since I’ve been at U.S. championships. This time I arrived without my skates, toting around a silly amount of shoes, for all the possibilities nationals can hold, even for the spectator. Arriving at the arena for the first time, seeing the ice and the panel set up for the judges, a wave of memories came rushing back and I felt as though I had never left. Is it possible for the desire to compete to ever leave you? I thought it was until I finally sat down and watched my first skating competition since beginning to compete myself. There’s no easy way to describe what it’s like being here and not participating. In some ways, I’m glad I don’t have to be out there risking everything and pushing my body to its limit, but in many more ways it feels wrong to be sitting on the sidelines and traveling without my skates. Talking with friend, and fellow Olympian Emily Hughes, we both agree, “it just feels really weird”. There were a lot of things I didn’t realize happened before we all took to the ice. I had no idea the videos being played were so intense, really adding to the anticipation of that last group. I had no idea they showed people in the audience, just like many other sporting events. I had no idea just how nerve wracking it can be to watch your friends perform programs that can change their lives. Watching the ladies free program was a roller coaster ride of emotions. As a skater you know what is going through their minds and how it feels to receive that standing ovation or fall in front of a nearly sold out arena. It’s nearly impossible not to feel the skater’s exuberance or their heartbreak, as I found myself in both tears of sadness and joy. Something else I felt was that familiar pull to the ice. The itch to compete can never leave an athlete, no matter how much time comes to pass. That desire to skate and to test my character all while standing alone in the center of the ice surrounded by thousands is hardwired in my soul and will most likely always present itself in the presence of every skater’s stage. A stage that is both welcoming and daunting. Nancy Meiss, a distinguished 50-year judge, a tireless volunteer and one of the sport’s most ardent supporters, surrounded herself with the things she loved. When she passed away Jan. 1, 2013, in Cincinnati, her mementos were a collection of a life well-lived. Now, after selecting keepsakes near to their hearts, Meiss’ family is making many of the items public in an online auction that is drawing the attention of figure skating fans and collectors worldwide. There are so many figurines, artwork and Olympic collectibles that just viewing them online is a treat. To view the auction site, go to: https://www.ebth.com/sales/2441-hyde-park-ohio-personal-property-sale. The auction ends at 8:46 p.m. ET Nov. 23. Meiss, who was born Dec. 12, 1922, began her career in 1958 as an ice dancing and figures judge. She judged at every level, including World Championships and the 1988 Olympic Winter Games in Calgary. In 2009, she was inducted into the U.S. Figure Skating Hall of Fame.